“Game of Thrones” star Peter Dinklage spent several years helping turn an expansive, pre-suicide interview with the French actor Hervé Villechaize by journalist Sacha Gervasi into a screenplay, which makes its debut as the original film “My Dinner with Hervé” (HBO, 8 p.m.), written and directed by Gervasi. There was more to the actor with dwarfism, who was an artist before he became an actor who made his splash in “The Man with the Golden Gun.” He became best known and forever typecast as Tattoo, yelling about “De plane!” in ion TV’s “Fantasy Island” and had difficulty dealing with fame before he died in Los Angeles in 1993 at age 50. 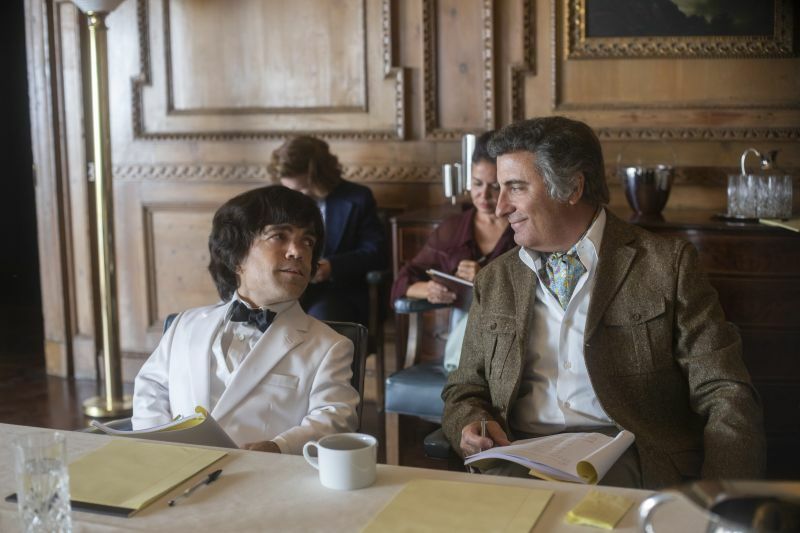 Affectingly portrayed by Dinklage (who looks very little like him), the cast also includes Jamie Dorman, Andy Garcia (as Ricardo Montalbán), Mireille Enos, David Strathairn and Oona Chaplin. A “Hocus Pocus 25th Anniversary Halloween Bash” (Freeform, 8:15 p.m.) is held in the middle of two screenings of the perennial “Hocus Pocus” (Freeform, 6:05 and 10:15 p.m.). College football dominates broadcast prime time with Ohio State at Purdue (ABC, 7:30 p.m.) and Oregon at Washington State (Fox, 7:30 p.m.). But the deciding game in the National League Championship Series will have higher stakes with Game 7 of Dodgers at Milwaukee (Fox Sports 1, 8 p.m.). Kelly Rutherford and Cameron Mathison star in the made-for-TV romance “Love, of Course” (Hallmark, 8 p.m.) about an administrator and professor planning a Harvest Festival. Makenzie Vega and Gabby Douglas are also featured. When Kristy Swanson moves her daughters to a new city, one of them takes police in a mysterious voodoo doll in the made-for-TV “Killer Under the Bed” (Lifetime, 8 p.m.), which also stars Brec Bassinger and Madison Lawlor. A 10-year reunion is ruined when the school mascot morphs into a bloodthirsty warthog on the made-for-TV horror movie “Killer High” (Syfy, 8 p.m.) starring Kacey Rohl. The team on “Wolves and Warriors” (Animal Planet, 10 p.m.) try to rescue 26 wolves from an Oklahoma zoo. Before you get ready for Halloween, there’s the “Countdown to Christmas Preview Special” (Hallmark, 10 p.m.). Couples share what they’ve learned on the season finale of “Black Love” (OWN, 10 p.m.). A family looks for its first dog on “Pit Bulls and Parolees” (Animal Planet, 9 p.m.). There’s a double feature of Ed Begley on Turner Classic Movies with “Patterns” (8 p.m.) and “Sweet Bird of Youth” (9:45 p.m.). Then comes “The Hunted” (midnight) and “The Wanderers” (2 a.m.) and “Bloodbrothers” (4 a.m.). College football starts at noon with games that include Michigan at Michigan State (Fox), Oklahoma at TCU (ABC), Auburn at Mississippi (ESPN), Maryland at Iowa (ESPN2), Cincinnati at Temple (ESPNU), Miami, Ohio at Army (CBS Sports) and Illinois at Wisconsin (Fox Sports 1). Games at 3:30 p.m. include Alabama at Tennessee (CBS), Colorado at Washington (Fox), Penn State at Indiana (ABC), N.C. State at Clemson (ESPN), Wake Forest at Florida State (ESPN2), SMU at Tulane (ESPNU), Houston at Navy (CBS Sports) and Kansas at Texas Tech (Fox Sports 1). Later comes Mississippi State at LSU (ESPN, 7 p.m.), Central Florida at East Carolina (ESPN2, 7 p.m.), Connecticut at South Florida (CBS Sports, 7 p.m.), Fresno State at New Mexico (ESPNU, 7:30 p.m.), Arizona at UCLA (ESPN2, 10:30 p.m.) and San Jose State at San Diego State (CBS Sports, 10:30 p.m.). NBA action includes Toronto at Washington (NBA, 7 p.m.) and Houston at Lakers (ESPN, 10:30 p.m.). Hockey Saturday Night has St. Louis at Toronto (NHL, 7 p.m.). NASCAR runs its Kansas Lottery 300 (NBC, 3 p.m.). Sam Smith and Anderson East perform on a new “Austin City Limits” (PBS, 11 p.m.). There’s already a rerun on “Saturday Night Live” (NBC, 11:30 p.m.). It’s the season opener with Adam Driver with Kanye West’s weird performances although the show is stolen by Matt Damon as Brett Kavanaugh in the cold open.